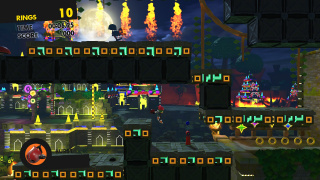 Secret Stages are six optional stages in Sonic Forces that can be unlocked by reclaiming territory on the World Map as the player progresses through the game. Completing these stages will unlock extra Avatar items and offer bonus experience for the Avatar. These levels have the same gameplay mechanics as the regular levels in Sonic Forces, but are much shorter. They are always played from a 2.5D perspective and put special emphasis on a particular gimmick or obstacle, such as flamethrowers and exploding blocks. The routes the player travels along in a secret stage are likewise different from those in regular stages, having been constructed from the ground up with additional plaforms and basic building blocks, such as unbreakable Containers. These stages are similar to the Challenge Acts from Sonic Generations and the smaller Acts in Sonic Colours regarding size and duration, as well as elements found like Reviving Blocks and Sprinklers. Each stage is set in the respective territory that they are unlocked in as the player progresses through the game. Only Modern Sonic and the Avatar are playable in these stages, with Shadow the Hedgehog being playable in Sonic's stages if Episode Shadow has been downloaded. 1 Fire Cannon 1 Mystic Jungle Avatar Clear Aqua Road. 2 Vanish Panel 1 City Sonic/Shadow Clear Red Gate Bridge. 3 Bomb Block 1 Green Hill Sonic/Shadow Clear Guardian Rock. 4 Plasma Cannon 1 Chemical Plant Avatar Clear Network Terminal. 5 Laser Cannon 1 Death Egg Sonic/Shadow Clear Death Egg. 6 Reverse Block 1 Metropolis Avatar Clear Null Space. This page was last edited on 19 May 2018, at 14:53.